Unreal SP - A forum dedicated to the Single Player element of Unreal, featuring discussions of maps, cut content, and general trivia. Some early versions of the retail game used disc checks. Unreal Gold. Prepackaged with nGlide v1.02. Unreal Gold includes the Return to Na Pali expansion. 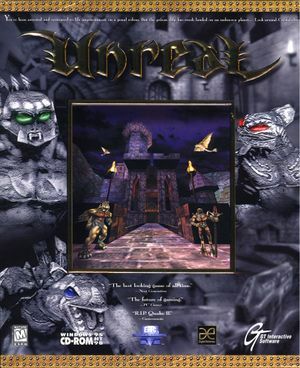 The Linux installer is available for Unreal Gold, Unreal, Return To Na Pali, they are based on Loki Software's linux port Unreal Tournament, although it treats Unreal as a mod. Requires the CD for installation. See Running native Linux version. The complete soundtrack is found in <path-to-game>\Music in UMX format. These can be converted into standard lossless audio files using a tracker player such as XMPlay or a tracker editor such as OpenMPT. A faithful higher quality icon for Windows can be found on the files section. A huge patch, it adds support for modern Windows, extra renders, multiple bug fixes, and many other additions. It also includes a patch to allow Unreal to run natively on Linux, however it requires Wine or a Windows partition to get the files. Removes DRM from Steam version and disables GOG Galaxy integration. If on Mac, try Unreal Gold OS X instead. A list of new configuration settings can be found on the OldUnreal forums. Linux version uses a separate INI file called UnrealLinux.ini. See the WSGF Unreal entry for details. The OldUnreal 227 Patch is required. See the WSGF Unreal entry for details. Force with nGlide or dgVoodoo if using Glide. The OldUnreal 227 Patch is required for other APIs and widescreen. Default FOV is 90. The OldUnreal 227 Patch is required for simple selection. Otherwise type fov in the console, followed by the desired fov. Use 100 for 16:10 or 106.4 for 16:9 to maintain the same vertical FOV as 4:3. 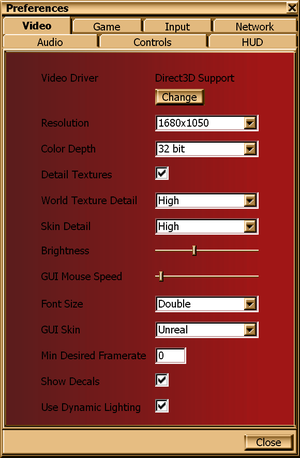 Use an FOV calculator for other aspect ratios. Click the resize icon in the top right corner of the in-game taskbar. Automatically switches to software renderer if using D3D 6/7 or Glide. forced via GPU control panel/tools, or use the Direct3D8, Direct3D9, OpenGL, or Direct3D10 renderers and set MaxAnisotropy in configuration file. Glide: Use nGlide and force via GPU control panel. Direct3D8, Direct3D9, and OpenGL: enable MSAA in configuration file or force SGSSAA with Nvidia Profile Inspector. Glide: Use nGlide and force in nGlide configurator. Direct3D8, Direct3D9, and OpenGL: Always on; force off GPU control panel. For Windows 8 and later use nGlide, Unreal engine Direct3D 10 renderer, or the OldUnreal 227 patch’s OpenGL or D3D9 renderer to avoid 30 FPS cap. Option available for double-sized font in main menu. Use OldUnreal 227 Patch to increase the size of the translator to up to four times the original. Installing the Direct3D 10 renderer allows you to play the game in high-resolution, widescreen, and Direct3D 10. There's also a Direct3D 11 renderer, but currently no significant changes from D3D10 renderer. It is also worth noting that the DX10/11 renderer will not work with the 227 Oldunreal Patches; use the built in OpenGL or D3D9 renderer instead. Use the S3TC Textures for high resolution environment textures [Note 4]. Use the High Resolution Skins for higher quality character textures. Do not use these server-side. Not compatible with Glide, D3D 6/7, or software renderers. Authentic to the original textures' artstyle, although some of the S3TC textures have increased saturation/are more colorful compared to the originals. nGlide's DirectX 9 wrapper does not use mimpaping, resulting in texture aliasing on distant textures. Use nGlide's Vulkan wrapper or the 227 patch's OpenGL or D3D9 renderer instead. These also let you force mipmapping, by setting AutoGenerateMipmaps and AlwaysMipmap to true in <path-to-game>\Unreal.ini\<path-to-game>\UnrealLinux.ini. The 227 patch's OpenGL and D3D9 renderers allow you to disable bilinear filtering by setting NoFiltering to true in <path-to-game>\Unreal.ini. 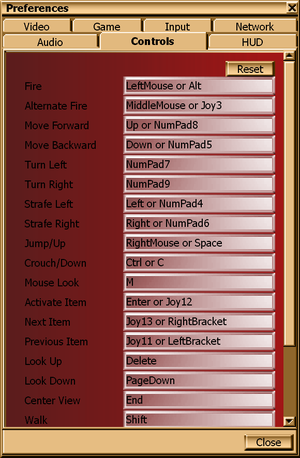 Additional inputs can be rebound in User.ini. 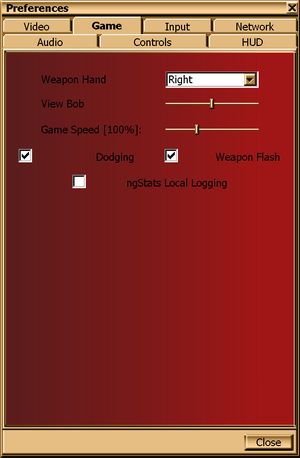 Separate GUI and camera sensitivity speeds. Mouse sensitivity is affected by the field of view. 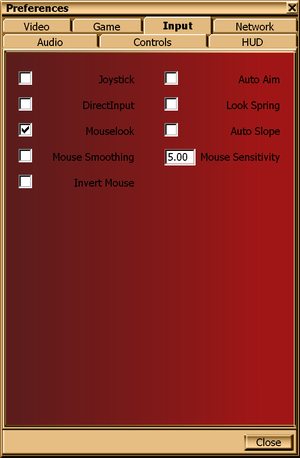 Therefore it is recommended to use mouse-sensitivity.com to calculate the sensitivity based on the desired field of view and make sure the DirectInput option (or RawHIDInput if the OldUnreal 227 Patch is installed) in Preferences -> Input is checked as this option ignores the Windows Pointer Speed. 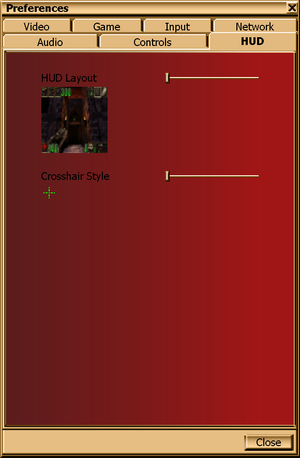 Cannot scroll lists with a scroll wheel. A3D support could require to reduce sound channels to 8. Use the OldUnreal 227 Patch to play without GameSpy. nGlide lets the user set a separate rendering resolution for 3D elements, while 2D elements are upscaled from the application-reported resolution. Download and install the OldUnreal 227 Patch. Download the ALAudio for Unreal 227i mod, and copy its contents (not the folder) to <path-to-game>\System. Open Unreal.ini and search for [ALAudio.ALAudioSubsystem]. Replace everything under that section with the new settings at the bottom of the post here. Replace UseHRTF=Autodetect with UseHRTF=Enable. 6, 7, 8, 9, 10, 11 Not included with original release. 6 was added in via Patch v216. 7 was added via Patch v226 and replaced Direct3D 6 support. To add in Direct3D 8 and 9 support, the OldUnreal 227 Patch is required. For Direct3D 10 and 11 support, see D3D10/High Res/Widescreen Fix. 1.2, 2.0 Since patch v216. OldUnreal 227 Patch adds OpenGL 2.0 support. Galaxy Audio, FMOD, OpenAL The OldUnreal 227 Patch is required for FMOD and OpenAL. FMOD is used for music, while OpenAL for sound effects. SDL SDL is for Linux only. It uses the V1 series. GameSpy Not used with OldUnreal 227 Patch. Various modifications, custom content such as characters, maps, plugins, and total-conversion mods can be downloaded and installed for Unreal. Like every game in the Unreal franchise, there's a ton of mods floating around the web on fansites like Oldunreal. Unreal User Maps is a website hosted by Oldunreal. They host not only maps but the tools you'll need to make them. A complete list of console commands are listed here. The fastest way possible to run the game on Linux natively is to use one of the Lutris scripts along with Arch Fix one, which fixes the audio issue and for open source GPU drivers it sets the Mesa compatibility to 1999. The script uses OldUnreal's Linux build which can be acquired only by installing the patch through Wine, but in Lutris case it is not necessary as it's included in their repository. 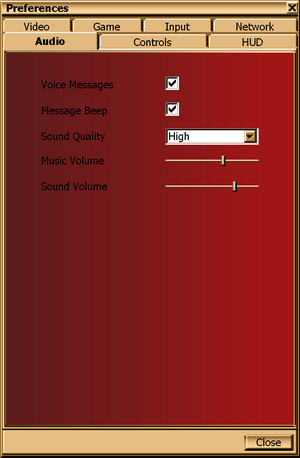 However, as the description notes, you must change the FMODDevices to 27 in [ALAudio.ALAudioSubsystem] section in UnrealLinux.ini (Located in System folder) when you change the settings in-game. If the music does not work, get the 32-bit esound package (Sometimes it can be called esd) from the package manager or download one, run esd in Terminal once, then change FMODOutput to ESD in the same section. The FAQ for playing Unreal 227 on Linux is on the OldUnreal Wiki. ↑ 2.0 2.1 File/folder structure within this directory reflects the path(s) listed for Windows and/or Steam game data (use Wine regedit to access Windows registry paths). Games with Steam Cloud support may store data in ~/.steam/steam/userdata/<user-id>/13250/ in addition to or instead of this directory. The app ID (13250) may differ in some cases. Treat backslashes as forward slashes. See the glossary page for details. ↑ 85 FPS chosen based on performance on contemporary hardware. ↑ The Low End pack requires 32-128MB VRAM and a Pentium II. The High End Pack requires 128-512MB VRAM and a Pentium 4. The Extreme End pack requires 512-4096MB VRAM (256-4096MB VRAM in SLI) and a Pentium 4 or higher. This page was last edited on 24 April 2019, at 18:49.